Our day begins, as every good day should, with a drive through Paradise Valley as we make our way north from Gardiner to Livingston. From here we head west on I90, between grey-green forests, over high passes, alongside bright orange BNSF locos and past the rusting corpses of the 50s trucks and old farm vehicles that decorate the landscape round these parts. A combination of a light dusting of overnight snow and the brilliant blue of a clear Montana winter sky makes everything seem like it’s been given a fresh lick of a bright white paint. And the contrast between this winter freshness and the city of Butte couldn’t be more vivid. Once known as The Richest Hill On Earth, Butte owe its existence to the gold discovered in Silver Bow Creek in 1864, and the silver and copper that was subsequently mined in huge quantities. Today the city is dotted with pit headframes, dark satanic monuments to the years of digging, drilling, blasting and cutting that went into ripping precious ores from once pristine hillsides. It sounds hellish ugly and it would certainly be hard to argue that mankind’s impact on the landscape has been anything other than negative, but there’s another side to Butte. Its isolated location and unwavering focus on a single industry has deterred developers and speculators from attempting to come in and start smartening things up. The stores and the warehouses, the banks and bars, the hotels and the offices are all as they were when they were first built. There are literally thousands of historic buildings, many bearing so-called ‘ghost signs’, huge, faded advertisements that once enticed the good people of Butte to enjoy the Bronx Lounge’s Italian Cuisine, to drink either Butte Special, “Montana’s Finest Beer” or Butte Beer, “It Deserves Preference”, and then to sleep it off at The Leggat Fireproof Hotel. Such is the importance of this collection of buildings that the city of Butte is one of only two in the country to be recognised as National Historic Landmark. It’s somewhere we passed through on a whim, pulling off the interstate to buy lunch, but we’ll certainly be back to see more when we’re next in the region. From Butte we turn left onto Interstate 15 south, a big country drive if ever there was one. The road winds its way between the snow-covered mountains, a black ribbon that tapers to nothing as the landscape opens up to reveal unexpectedly long distance views. An occasional vehicle passes us in the opposite direction, drifting snow collects in the ruts that lead up to hillside homes, and power lines are a constant reminder that this is conquered territory, not wilderness. But despite these obvious indicators of man’s presence, the overwhelming sense is of passing through a land that has changed very little over the millennia and will look much the same when we’re long gone. We’ve all experienced that awesome recognition of one’s own insignificance when gazing up into a clear, star-filled night sky; the scale of Montana’s landscape can have the same effect. And if it has this impact from a 21st century Interstate, one can only begin to imagine how it must have felt to Lewis and Clark’s Corps of Discovery when they arrived here in August 1805, becoming the first citizens of the United States of America to set foot in these beautiful mountains. Charged by President Thomas Jefferson with mapping the immense territories of the West acquired under the Louisiana Purchase – and, equally if not more importantly, finding the fabled Northwest Passage, thus opening up a lucrative trading route to the markets of the east – the party had spent the previous 15 months pulling, pushing and carrying their boats up the Missouri from St Louis. On August 12, 1805, an advance party led by Captain Meriwether Lewis arrived at an ice-cold spring, determined it to be the source of the Missouri, and looked up towards a sharp ridge beyond which he hoped to see the land sloping away to the Pacific. Instead, the sight that greeted the party as they crested Lemhi Pass was that of snow-capped mountains stretching away into the distance as far as the eye could see. It’s a view that people now drive hundreds of miles to experience but it’s one that must have struck awe, horror and fear in equal measures in the hearts of these 19th century adventurers. With summer fast disappearing and Lewis having already expressed his anxiety to seek the help of local Indians in the form of horses and directions, the success of the expedition was in serious doubt. There then took place a meeting so important, so opportune, and so unlikely that it has become one of the best-known tales in American folklore. Just a day after the disheartening experience on the mountain ridge, Lewis’ party finally located the Lemhi Shoshone Tribe and conveyed to them their urgent need for horses. Although the Indians were keen to move on to their buffalo hunting grounds, Lewis convinced them to hold on for a few days more until the rest of the Corps of Discovery caught up. On August 17, Clark and his team arrived at the camp. Among the expedition party was a teenage Indian girl by the name Sacagawea. Five years earlier she had been kidnapped and sold to French-Canadian trapper Toussaint Charbonneau. In the winter of 1804, Sacagawea and Charbonneau joined the Corps to act as guides and interpreters. As they arrived at the Shoshone camp, Sacagawea was recognised as the missing sister of the tribe’s chief, Cameahwait. 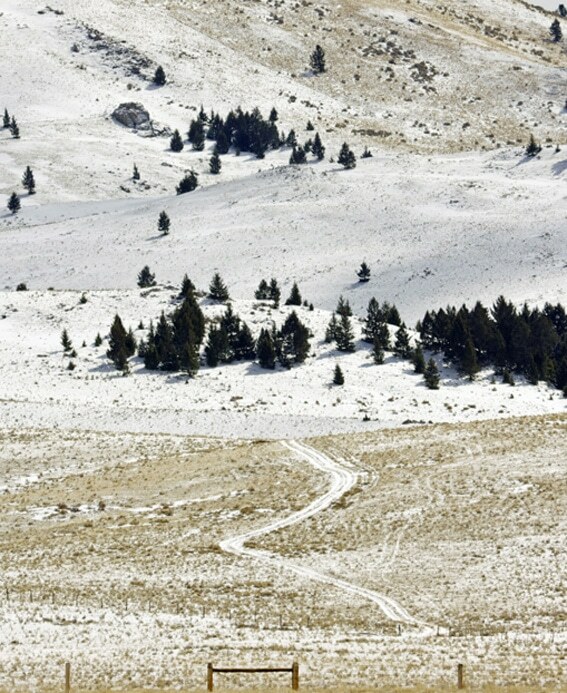 As well as being cause for great celebration, this extraordinary coincidence also cemented the trust necessary to convince the Shoshones to provide horses and details of a trail used by the Nez Perce tribe to cross the Bitterroot Mountains. The site of this fortuitous meeting became known as Camp Fortunate and was a critical point in Lewis and Clark’s journey: without the help of the Shoshone, the expedition would very probably have failed. Sadly, it’s impossible to visit the spot where the meeting took place as, in 1963, someone decided to build a dam and flood the valley. And as if to rub salt in the wound, instead of honouring Sacagawea and the Shoshone people, they named it Clark Canyon Reservoir. The idea of submerging Camp Fortunate under 100 feet of water may seem an unfitting memorial but the effect has been to return this important location to, if not near-wilderness, then something more fitting to its place in history than the town of Armstead that stood here before. While this was no doubt a lovely community much missed by those forced to leave their homes, it seems right that there are no longer any diners or gas stations to spoil the sense of remoteness. It also seems just that the town that had to be abandoned to the waters can trace its history back to the year of 1907, the very same year that Lemhi-Shoshone people were removed from these lands and relocated to a reservation 200 miles south. Stand on the shore and gaze out over the frozen white surface of Clark Canyon Reservoir, beyond the washed-out camouflage colours of the winter grass, to the dark mountains beyond and you can just about begin to imagine the magnitude of the challenge these intrepid explorers faced when they arrived here. Ideally of course, it’d be great to be to be able to visit the site as it was in 1805: remote, wild and pristine. But Montana needs its water. Visiting these places in the 21st century is inevitably a compromise, an experience in which we forego ‘authenticity’ for the convenience of an Interstate, interpretive signs and public restrooms. All power to those who scorn these comforts and venture off-grid into the real wilderness but for the vast majority of us, this is a deal with the devil we’re reasonably happy to make. Tonight’s destination is another example of mankind harnessing nature’s power and ending up with something far from unappealing into the bargain. Eastern Idaho’s largest city, Idaho Falls is something of a cultural oasis with its historic downtown, art galleries, theatres, museums, and – according to the Idaho Falls Convention and Visitors Bureau’s web site – more than 150 restaurants. And if that sounds slightly cynical, it’s only because the city has something of a track record with regard to spinning its attractions. Today’s bustling city began life as a small community by the name of Eagle Rock Ferry, the only crossing point on the Snake River for miles. It was, fellow fans of literal place names will be pleased to learn, named for the ferry operation that began operating here in 1862, a time when the most distinctive geographical feature nearby was indeed a rock on which eagles nested. In 1891, the city decided to rebrand itself, choosing a name that implied not only an abundance of water (as was their intention) but also, it has to be said, the existence of falls. However, were you to visit the newly-named Idaho Falls in 1891, the only ‘falls’ you’d find were some rapids. It wasn’t until 1911 that the distinctive retaining wall was built, diverting part of the river for hydroelectric power. Look at the falls and they’re clearly man-made, two lengths of raised wall in a dogleg alignment. But the effect is spectacular – well, as spectacular as any 20 ft-high falls can be – as the current splits in two, half of it cascading over the entire length of this 1200 ft-long marvel of early 20th century engineering. It’s cold, bright winter’s day and the waters reflect the azure blue sky. Birds hop along the edge, nodding and dipping for bugs, joggers plod along the banks, and over to the left the city’s brilliant white LDS Temple shines in the sunshine, a golden angel Moroni glistening at the top of the steeple. It’s an extraordinarily picturesque scene, just one of many that make Idaho Falls a city that deserves a more thorough exploration than we’re able to give it. Time constraints and a bitterly cold wind limit us to a brisk walk along the falls themselves before seeking shelter in the Snow Eagle brew pub just along from our hotel. And here we learn two things: that their Mangy Wolf Blonde Ale tastes a whole lot better than it sounds, and that the best time to visit is when the falls are frozen over, as was the case just two or three weeks ago. Now that I’d like to see. This entry was posted in Yellowstone wolves and tagged butte, gardiner, idaho, idaho falls, jefferson, lewis and clark, montana, sacagawea, shoshone.